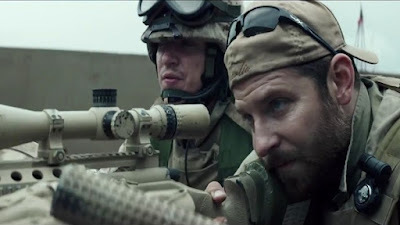 Chris Kyle is on record as being the most lethal sniper in US Military history, with 160 confirmed kills out of a suspected 255. 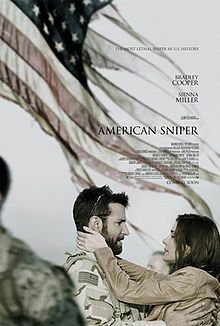 When word got out that Clint Eastwood would be adapting Kyle's book into a major motion picture, “American Sniper,” there were protests and complaints, as there usually are when such subject matter such as this is turned into a film. Many critics of war have claimed that this man can not possibly be considered a hero. Who can kill so many people, with such ease (and glee, if his logs are to be believed), be considered anything but evil? Eastwood is old though, and with age usually comes wisdom. He see's clearly how Kyle is a hero. That is why “American Sniper” feels so patriotic in the face of such horrible death that surrounds it. 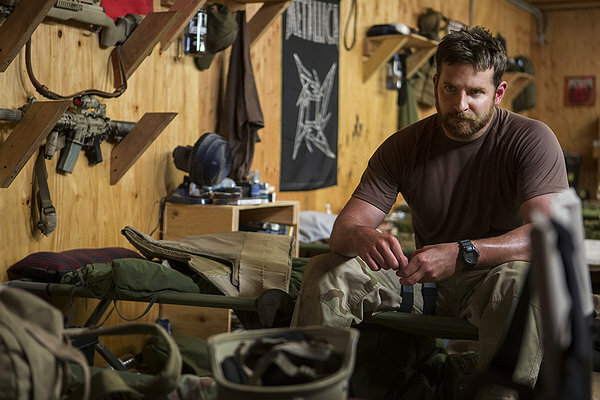 When we first meet Kyle (Bradley Cooper) he is in position, covering his men during his first tour in Iraq. He witnesses a woman hand a boy a grenade and instructs the kid to attack the American soldiers with it. In that moment Kyle is in a situation where no one can truly relate. There is a kid with a weapon, no other soldier can confirm this, and thus the call to kill him is in Kyles hands. At this point who that kid might be, what life he might live, none of it matters. All he sees is someone with a weapon is going to kill his men. So what does he do? He takes the shot. I mean, what else was he going to do? Given the choice between saving a dozen of his fellow soldiers and this kid, he'll easily shoot the kid. This is just one decision though. He has to deal with dozens of situations like this on a daily basis. There are times he's on the ground with the men who covers, and now his life might be in the hands of others as well. This is the life he lives. He is there to save lives. Some of the men he protects (including his own brother) are starting to look at what they are doing, the reasons for them being at war, with disdain and doubt. Kyle has no time to think like that. He's got a job to do, and whether these men believe in the war anymore or not, that job is to keep them alive during it. So too, are we now part of the war, as Eastwood pits us tightly in every situation Kyle finds himself in. Most war movies we watch we are witnesses to the grand horror that is on display. Here we are almost always by Kyles side, putting us into the horror itself as if we were there. The film was recently remastered for an IMAX release, which is where I saw it, and the extra size just brought the intimacy of the film that much closer. This is important because the most intense moments do come from the distance, where Kyle is forced to make the kind of decisions we could only imagine making. The movie also takes time to show us his home life with his wife (Sienna Miller), who spends most of the time worried about her husband and begging him to come home. Though many might say the whole point of her character is to be a nagging wife, the reality is that she just can't understand what life is like over in Iraq, and because of that she may be the only dose of reality her husband gets in his life. I'm not sure how much of Kyles story was changed for the movie. Some say he enjoyed killing more than what portrayed in the movie. 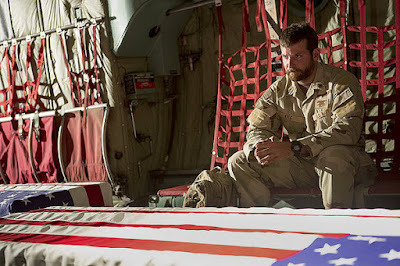 I don't know what people were expecting him to be portrayed as, but I think Kyles dedication to the war, while certainly motivated in part because of his need to protect his men, shows that there is a huge part of him that does enjoy the killing, and does get a high out of the hunt. At one point he is in a situation where he might need to kill a potentially innocent bystander. In his mind he begs the person to stop what they are doing, but when the person does drop the weapon Kyle breaths a breath of disappointment. We can tell that, deep down, he wanted to kill that person, and was upset because he didn't get to. Yet Eastwood understands that it is the nature of the beast that can cause men to feel this way. 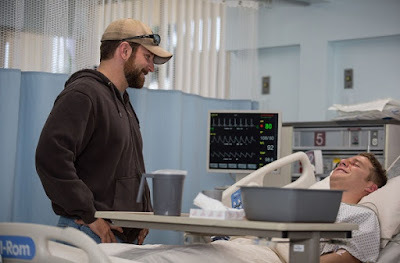 So too, does Bradley Cooper, who gives the sort of nuanced performance that can make or break a movie, and thankfully he understands this situation and character in a way that brings the movie so close to home. That Kyle was a natural killer did not make him a bad guy, and both Copper and Eastwood know this. He was a hero, just one who happened to have the most kills on US Military record. Some people might not be able to understand this. I think “American Sniper” is an attempt to bring this reality to the movie going public. Knowing how stubborn people are, I doubt this will take. But if you take away just one thing, take away the final image of Chris Kyle's funeral. Navy Seals have a tradition of honoring men they respect with personal emblems punched onto the caskets. Chris Kyle had more of these emblems on his coffin than any coffin I have ever seen before. If this image doesn't make it clear the difference Chris Kyle made in the lives of the men he was hired to protect, then I can only assume you are as heartless a human being as you claim Chris Kyle is. Parents, there is strong language and intense war violence. Recommended for ages 17 and up.